Batman (Michael Keaton) fights crime in Gotham city as a vigilante. After attempting to foil a break-in at Axis chemicals, Batman accidentally drops mob enforcer Jack Napier (Jack Nicholson) into a vat of toxic chemicals, inadvertently turning him into The Joker. Now completely insane, The Joker takes over his businesses of his old bosses and wreaks havoc on Gotham. Tim Burton's "Batman" offered an entirely different, much darker look of the caped crusader. Up until the release of this film in 1989, the only theatrical incarnation of Batman was the campy 1966 version starring Adam West. Don't get us wrong, that Batman is fine for what it is, but it gives a much more lighthearted, silly look at Batman, his friends, and his enemies. What Richard Donner did with "Superman" in 1978, Tim Burton managed to do with "Batman" in 1989. They were both able to show that just because they were making movies based off of comic books didn't mean they had to make movies intended for children. Burton successfully created a version of Batman that had mass appeal across the board and the film became a huge box office success, grossing $411 million worldwide on a mere $35 million dollar budget. Impressive for any time, really, but more impressive for 1989. 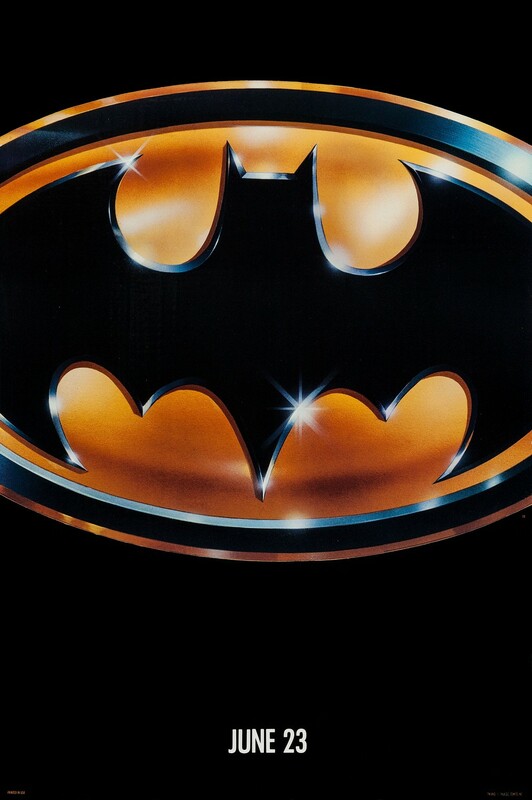 Michael Keaton fills the role of Batman/Bruce Wayne and does a damn fine job in the part. He may even rival Christian Bale for the best portrayal of the character. Keaton has this charismatic swagger about him as Wayne and a commanding authority about him as Batman. At the time of its release, there was a section of the population that was perplexed by Burton's choice to cast Keaton, aka Mr. Mom in this part, but it was a gamble that paid off handsomely, in our opinion. Some may disagree with us, and that's just fine, but we really enjoyed his performance here. As good as Keaton was as Batman, he couldn't hold a candle to the tremendously wonderful Jack Nicholson, who offered a psychotic and simultaneously over the top and nuanced performance as the deranged villain The Joker. Long before Heath Ledger won an Oscar for his performance as the same character, Nicholson held the title as the best Joker with his maniacal laugh, his simple but freaky makeup, and his hysterical and demented demeanor. This is not a complaint whatsoever, but Nicholson really overshadowed the entire film. Kim Basinger also stars as Vicky Vale, a photojournalist who has taken and interest in Batman. She also acts as the love interest of Bruce Wayne and an object of desire for the Joker. She puts on a solid performance, but is clearly not the best part of the movie. Tim Burton's Gotham is made to look dark and dingy with both a retro and more modern feel at the same time. Burton tells a great story, touching briefly on the origin of Batman, as well as showing the origin of The Joker. Like most great comic book movies, this is a very character-focused film, and though it is a superhero movie, it has the more intimate feeling of a crime-noir blended with comic book elements. We like the darker side of the characters and the setting this movie offers from Burton's wild imagination. This allowed Batman to truly be a hero and The Joker to truly be a villain. They both excel at it, unlike the television show and subsequent movie with Adam West where the characters were all treated as bumbling jokes of themselves. In 2016, it's terribly difficult to go back and re-watch the older Batman movies without knowing there is a trilogy of more recent better Batmans from Christopher Nolan. As a one-offed film, "Batman" could have stood alone in all its glory, but knowing what was to come, both the bad (Joel Schumacher's terrible installments) and the good (Nolan's award winning films) could potentially tarnish the reputation of the franchise for some people. In the end, it doesn't matter to us because this was and still is an excellent take on Batman. It is still a relatively entertaining viewing experience we enjoy to this day, though it does feel a bit dated in some aspects. One year ago, we were watching: "Bunraku"